Haggen has left the county. 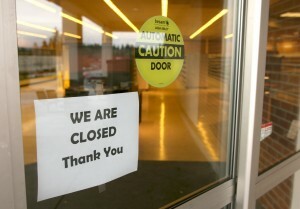 The grocery chain’s store in the Port Orchard Bethel Junction shopping center was closed and cleaned out last week. 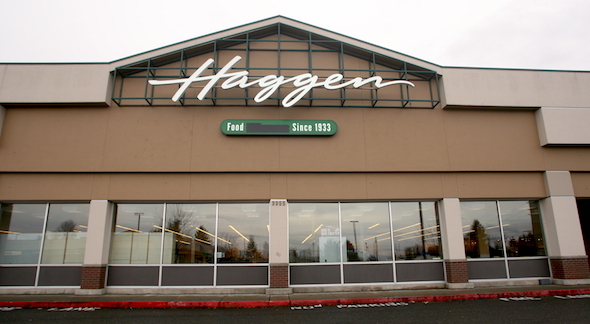 Haggen shuttered its stores in East Bremerton and Silverdale at the end of November. I haven’t heard exactly when the Port Orchard location shut down. If you happen to know, please drop a comment below. Unlike the Bremerton and Silverdale Haggens, the Port Orchard store already has a new owner in place. Albertsons LLC. bought the location in a bankruptcy auction last month and plans to return it to the Safeway brand. A timeline for the reopening has not been announced. The three Kitsap County stores were among 146 Haggen acquired from Albertsons and Safeway early this year, as the two mega-grocers completed a merger. The East Bremerton and Silverdale stores were previously operated by Albertsons. The Port Orchard store was a Safeway. Haggen’s bold expansion ultimately flopped. The company filed for bankruptcy reorganization in September and held auctions to begin selling off assets. The Bellingham Herald reports Haggen will try to sell the remainder of its stores, including its original Whatcom County locations, at an auction scheduled for February. Kingston’s downtown grocery store is getting a new name and an overhaul. The IGA was bought this by Food Market, a small Pierce County grocery chain. The store, at 10978 NE State Highway 104, will soon be rebranded Food Market at Kingston. Longtime store owner Rick Bjornson reached an agreement earlier this year with Food Market owner Don Stolz, our partners at the Kitsap Peninsula Business Journal reported. The new owners are freshening up the store with a remodel set to begin Sunday. Food Market Operations Manager Kip Bonds said the tile floor will be pulled up and the concrete below will be ground and polished. Other changes include all-new lighting, new check stands, a new service center, new and overhauled produce cases, a soup bar and a drip coffee station. Bonds said there’s no firm timeline for the remodel. A date for a grand opening under the new brand will be announced soon. Food Market has a different wholesaler than IGA, but Bonds said customers can expect product offerings to be roughly the same. The organics section will be expanded. Bonds said many staff members stayed on with the new company and some new part-time employees were hired. The store has a new manager. Food Market will offer new sales and incentives for shoppers, including a 1 percent rebate program for nonprofit groups. Food Market’s other locations are in Lea Hill (Auburn), Key Center and Lake Kathryn (Gig Harbor). 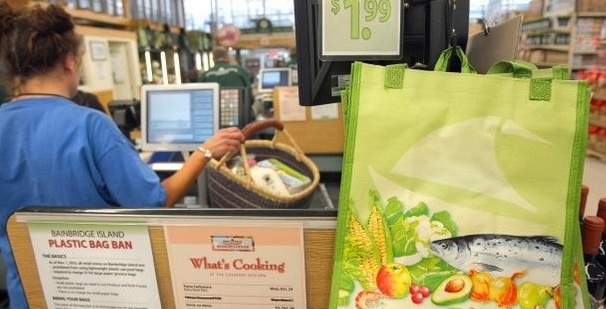 Bainbridge Island enacted a ban on plastic shopping bags 18 months ago. The city ordinance eliminated plastic bags and imposed a five cent fee on paper bags (retailers keep the revenue). The hope was shoppers would transition to reusable bags, cutting down on waste. At Winslow’s Town & Country supermarket that appears to have happened. It should be noted the reusable bag figures represent transactions, not actual bags, since the bags can be used over and over. T&C gave a nickel discount to shoppers who remembered their reusable bags, creating a 10 cent incentive for shopping with cloth bags. 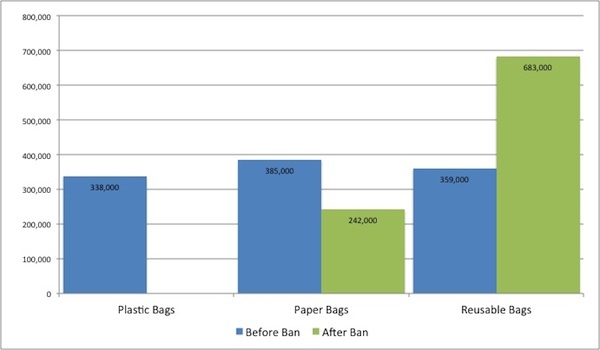 The plastic bag ban and the cash incentive appeared to not only promote reusable bags but also decrease paper bag use. Tony D’Onofrio, sustainability director for Town & Country Markets, said the ban took some adjustment for customers and staff but was well received. Other Kitsap cities were in no rush to follow Bainbridge’s lead on banning bags when we checked in with them in 2012. About a dozen Washington cities have adopted bag bans so far.